What better way to celebrate our birth (independence) than by rocking some birthday cake inspired ice cream. Sounds fair right? Ok, actually I bought this because I've been feeling a little guilty about my ice cream buying habits. I keep buying what I want to try, not what my daughter wants to try. So this one is all for her. Breyers BLASTS! Oreo Birthday Blast! 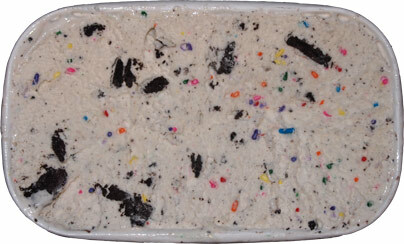 frozen dairy dessert is Oreo Cookie Pieces and Rainbow Spinkles in cake flavored frozen dairy dessert (artificially flavored). 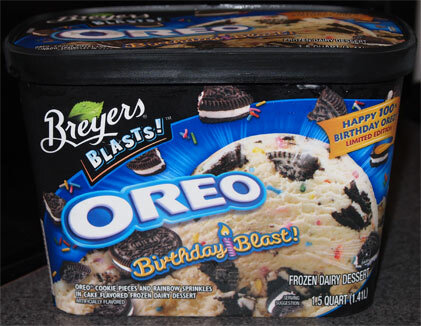 You all know I despise most cake flavored ice creams, and I didn't even really like the Birthday Oreos when they came out, but it's time to take one for the team (i.e. take 3 or 4 bites and give the rest to my daughter). Well it certainly looks fun. I'm a sucker for sprinkles because it's put a smile on your face long before the spoon reaches your taste buds -- actually, I don't care how old you are. Sprinkles are fun. They don't add any crunch here, it's all for show, but in this case that's ok.
How does it taste? Not bad actually. The cake flavor isn't too crazy so the ol' gag reflex isn't kicking in (just kidding, just kidding). The cake vibe is fairly tame but it's still enough to also mellow out the cookies & cream vibe. I like my cookie vibe big and then the other flavors to support it, but hey, that's just me. I think the crowd picking this one up is the cake crowd anyway. My daughter loves this one ofcourse. She had a bowl Monday night and she just polished off another bowl now. It's soft and squishy and easy to eat (or in my opinion: a bit gummy). The kids will love this and so will lots of others. I know this flavor is meant to correlate with Oreo's 100th birthday this year, but I would be totally surprised if it didn't come back next year. It rounds out the BLASTS offering with a cake flavor and that's just smart marketing. Ok, that's it. Have a happy and safe fourth everyone, and be careful on those roads... crazy people out.... like 18 year olds who let their unlicensed 15 year old girlfriends drive their beamers.... and unlicensed 15 year old girlfriends that have no idea how to drive beamers in holiday traffic and wind up crashing into you because they shouldn't be driving fast cars with so many other cars around.... sorry, it's been over a decade and I'm still bitter about getting stranded so far from home. On Third Scoop: I decided to scoop myself a bowl of this stuff last night, rather than just judging it on a half dozen bites. Well, I made it about halfway through a small bowl before starting to have flash backs to my Oreo Coolatta. That's it, I'm all done with this stuff. I was trying so hard to be open minded and non-judgmental, but I do not like this stuff at all. Happy 4th of July! I have looked for this one but can't find it anywhere. Glad your little girl liked it. Very nearly bought a container of this earlier today, but opted against it and picked up the Golden Oreo one instead. We'll see if I regret that. I missed out on the Birthday Oreos, but I'm a sucker for cake and sprinkle flavored anything. Love Funfetti and the Cupcake goldfish haha. I think I'd like this, even though I normally find Breyers Gritty and not worth my time. @indy, I think u might like that golden Oreo. I really liked it and most of the blast don't do it for me. It wasn't as good as baskin Robbins golden oro when that was out but a solid flavor. do you find all breyers gritty, or are the blasts (frozen dairy desserts) more gummy and less gritty to you? a lot of stores are taking their sweet time rotating the new blasts flavors out onto the shelves. Don't give up, you'll find it! Cookies n Cream being my fav flavor and Birthday Cake a close second. I always get Oreos in my Cake Batter Ice Cream at stores. This for me was an...hmmm how do I put this cleanly....excitement in a container. I love this flavor. i'm not a big fan of cake flavored things but the sprinkles always tempt me. i kinda liked the birthday oreos though and if this was ice cream rather than "dairy dessert" i'd probably give it a try. I agree with the reviewer. DISGUSTING! I thought it was just Oreo Cookie ice cream with sprinkles thrown in for fun. I almost went with a different brand for $.20 cheaper, but thought I'd splurge and have some fun. One bite, hmmm. Second bite, what is wrong with this stuff. The after taste is over powering. Third bite, I went out to look at the box and saw the small print "cake flavored frozen dairy dessert". My husband made it a little further than me, but while I dumped mine, he left his sitting on the counter. It kept it's shape for the most part. Kind of gooie? What is that?? Maybe I can get my son to eat it! Very dissapointed! So I recently purchased this ice cream and to my surprise when I went in for the first scooop there were no sprinkles. I'm sure the taste is pretty much the same without the sprinkles but that was the main reason why I made this purchase in the first place. The taste is okay but not the best and I don't think it's worth buying again based on my "missing sprinkles" experience.